Tibet Tour 7 days: Lhasa-Gyantse-Shigatse Tour is famous as Golden Triangle tour of Tibet. It connects to visit of three prime cities of Tibet: Lhasa, Gyantse, and Shigatse. Tibet Tour 7 days offers major highlights of Tibet including palaces, ancient monasteries, Plateau Lake, unique landscape and snow covered mountains. During two days of Lhasa sightseeing, on the first day, you make a visit to Potala Palace- the world’s highest palace built as the center of Tibet Government by the Fifth Dalai Lama in 1645. This palace was used by Dalai Lamas for their winter residence; Jokhang Temple- the holiest temple of Tibet and Barkhor Market- ancient round street market shows the original outlook of Lhasa. On the second day of Lhasa Sightseeing, you travel around Norbulingka, Sera Monastery, and Drepung Monastery. Norbulingka is another palace in Lhasa that was built in 1755. This palace became the summer residence of the successors of the seventh Dalai Lama. The garden surrounding this palace is the largest man-made garden in Tibet. Sera Monastery is one of three major monasteries in Lhasa, 6 km north of Potala Palace. This monastery is famous for everyday debates by monks on Buddhism. Similarly, Drepung Monastery is the largest monastery of Lhasa, 8 km west of Potala Palace. It is famed for the high standards of Buddhist academic study. On the way from Lhasa to Gyantse, you visit Yamdrok Lake- the sacred Lake with purely turquoise color water is surrounded by snow-capped mountains. 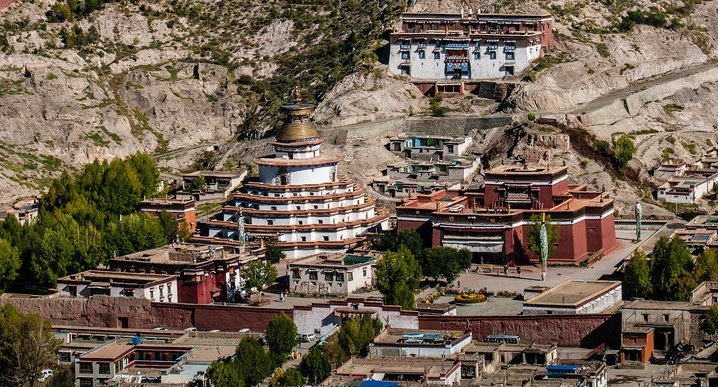 In Gyantse you do sightseeing of Palcho Monastery- built in the 15th century, Kumbum Stupa- the largest such structure in Tibet have 1000 Buddha statues, Gyantse Dzong- the old fortress and Manor of Pala family. From Gyantse, you move to Shigatse. This is the 2nd largest city of Tibet. Here you visit of Tashilhunpo Monastery- It is the biggest monastery in Tibet and belongs to Gelugpa Tibetan Buddhism. It contains a giant statue of Maitreya Buddha ‘the coming Buddha’. This monastery is also the seat of Panchen Lama, the highest ranking after Dalai Lama in Tibet. From Shigatse, you return back to Lhasa where you end of this fabulous trip. You will utilize your stay in Kathmandu by its sightseeing of wonderful World Heritage Sites. For the information of Chinese Visa click here . Also please contact us for any further information and the Price of Tibet Tour 7 days. Day 4: Drive from Lhasa to Gyantse. Highlight: On the way to Gyantse visit of Yamdrok, one of the three largest lakes in Tibet is surrounded by many snow-capped mountains and view of Karola Glacier. In Gyntse visit of Palcho Monastery also called Pelkor Chode Monastery (This monastery was built in the early 15th century. The wall paintings and Buddha statues in the monastery are worth seeing), Kubum Stupa (This temple is believed to be the largest such structure in Tibet with 9 floors, 77 Buddha halls, 108 doors and more than 1000 Buddha statues) and Gyantse Dzong (This is the fortress standing out on a rocky hill in a basin, it is truly eye-catching). Day 5: Drive from Gyantse to Shigatse. Highlight: Visit of Pala Manor 4 km southwest from Gyntse (This was the manor of the Pala Family. It is one of the three best-preserved noble manors of old Tibet. By visiting this manor, you can get a view of the lifestyle of the serfs and the wealthy people who once lived in this area). In Shigatse visit of Tashilhunpo monastery is the seat of successive Panchen Lamas founded by the First Dalai Lama in 1447 has more than 57 halls and 3600 rooms. This monastery has a giant statue of Maitreya Buddha (Future Buddha) which is the largest of its kind in China. The statue is 26 meters (85 ft) tall and contains 279 kilograms of gold and 150,000 kilograms of brass and copper. Day 6: Drive from Shigatse to Lhasa. Day 7: Departure from Tibet.